We’re in full thrust of the holiday season and even though I (thankfully) don’t have Christmas music blaring in every supermarket to remind me, I still feel the annual baking itch approaching. I’ve also been promising Evan I’d make chocolate chip cookies since the day I got here. That was two months ago. 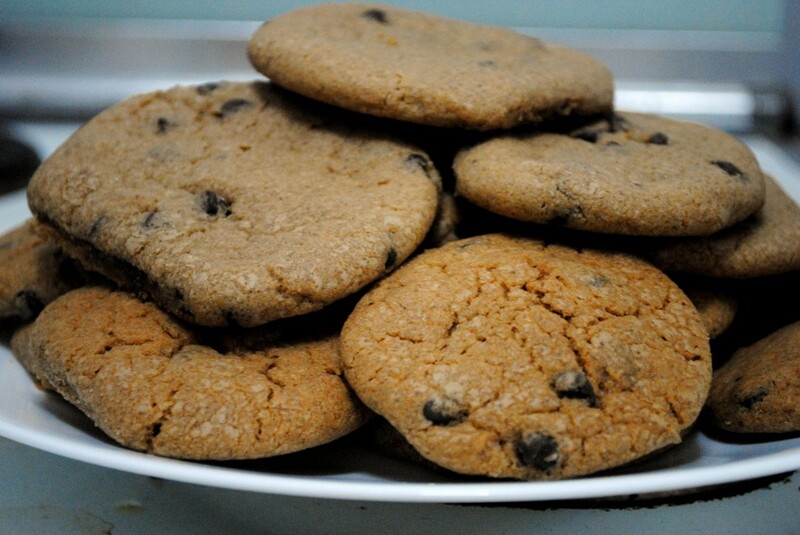 Chocolate chip cookies are as good a place to start as any! There are a million variations on these classic cookies, and they’re classic for a reason. Apparently they were invented in 1930 by Ruth Wakefield when she tried to make all chocolate cookies for the guests at her inn, the Toll House Inn. Yup. And she let Andrew Nestle publish the recipe on the chocolate bar wrapper in exchange for a free supply of chocolate. Due in part to the popularity of the recipe, Nestle started producing chocolate chips in 1939. Usually I would consult my Joy of Cooking for a basic recipe like this, but Martha Stewart was a good replacement. I made some alterations – boy do I miss my KitchenAid stand mixer – but mostly stuck to the original recipe. And, like most recipes from home I’ve tried to make here, they were good but just a little off. Turns out I bought parve/kosher chocolate chips instead of normal ones. Which still doesn’t explain why they smell like rum raisin and taste like liqueur… but it’s hard to go wrong with chocolate chip cookies. I’m a big fan of the salty-sweet balance and the salt really came through, making these downright addictive. 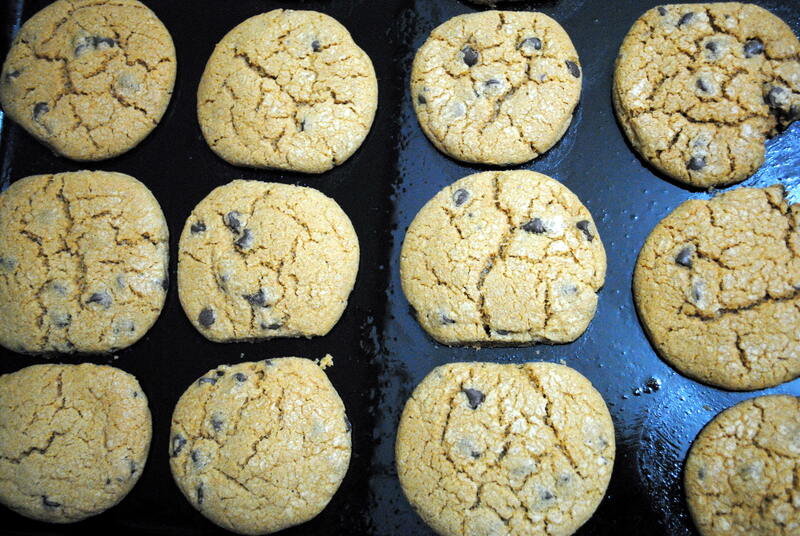 Tip: Form all the dough into cookies, but only bake as many as you want to eat. 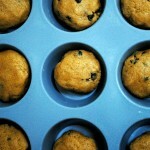 Put the rest on a baking sheet or in a muffin tin and freeze. Once they are frozen, transfer to an airtight container. Any time you want a cookie or five, remove from the freezer, put on a baking sheet and bake for 20 to 30 minutes in a 350°F oven. 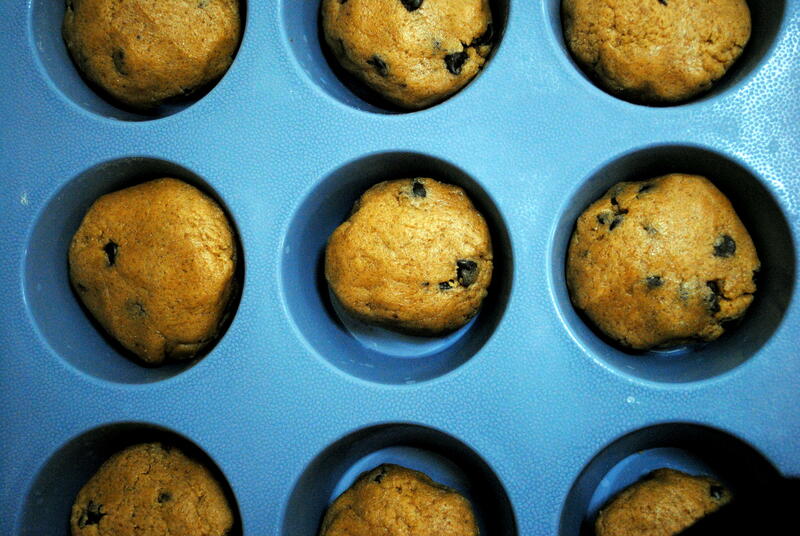 No need to defrost, just bake and enjoy. 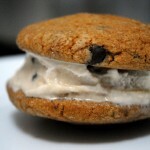 Variation: As a kid Chipwiches were my favorite guilty pleasure, at least until I was old enough to realize they were a guilty pleasure. 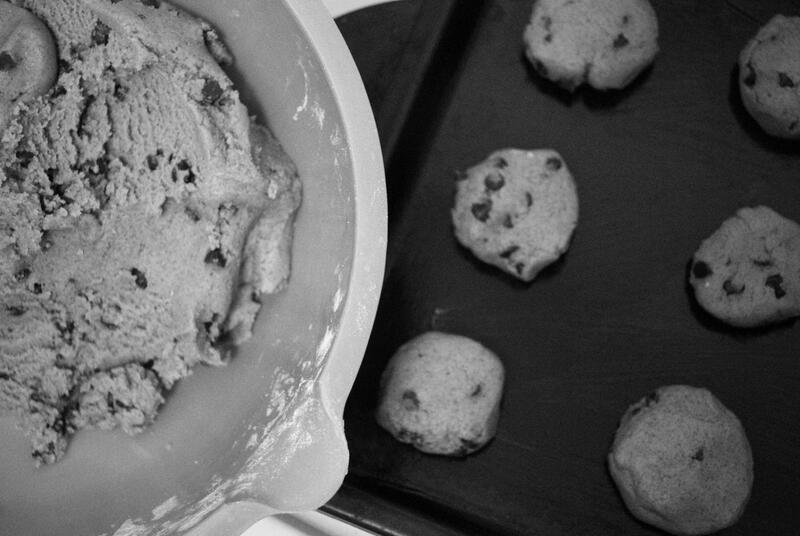 Make your own by pressing your choice of ice cream in between two small (or large if you’re feeling downright devilish) chocolate chip cookies. 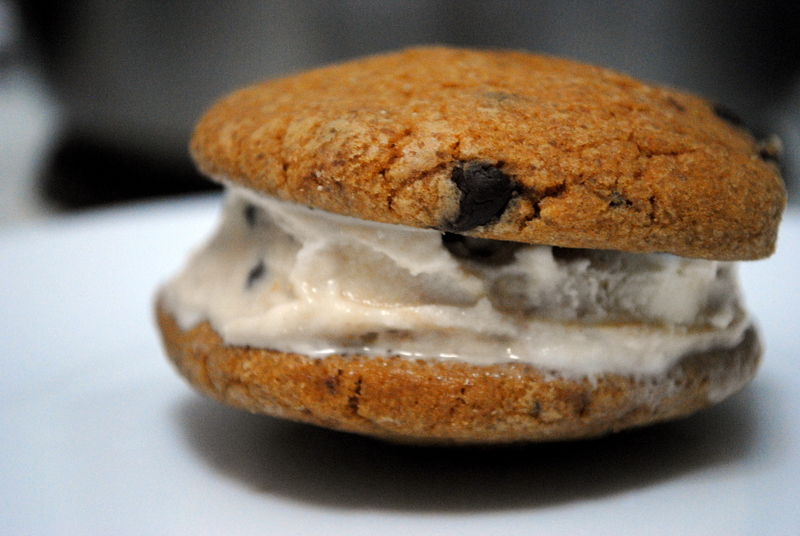 Make sure the cookies are fully cooled so as not to melt the ice cream. Softer cookies work best here, but crispy ones – while a little messy – are no less delicious. Preheat oven to 375°F. In a medium bowl, whisk together flour, baking soda, and salt. Set aside. In a large bowl combine butter and sugars until light and fluffy. Add eggs one at a time, beating well after each addition until combined. Mix in vanilla. Add flour mixture and mix until just incorporated. Stir in chocolate chips. 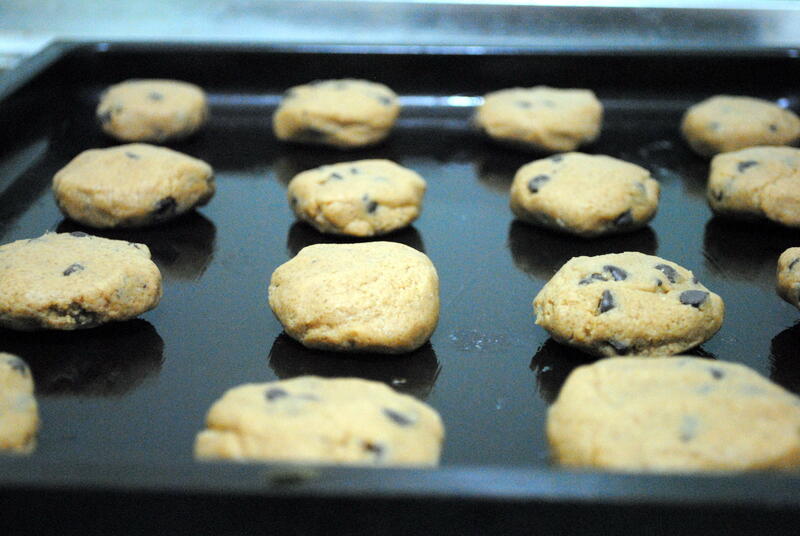 Drop small mounds of dough onto ungreased baking sheets, at least 4 inches apart and away from edges of pan. Bake until golden, 15 to 18 minutes, rotating sheets front to back and from top to bottom of oven halfway through. Cool 1 to 2 minutes on baking sheets, then transfer to a rack to cool completely. Store in an airtight container up to 2 days. 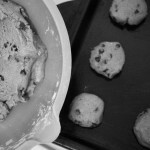 I just tried this recipe http://www.marthastewart.com/recipe/crisp-and-chewy-chocolate-chip-cookies with real, 60% cacao, non-parve chocolate chips. Divine. (The only change was that I cut 1/4 cup butter – we’re in a butter shortage, people). Just made them again and had only one egg on hand. I tried making an egg substitute and it worked fabulously: 1 whole egg = 2 tbsp water and 1 tbsp oil and 2 tsp baking powder.